I get my inspiration for writing recipes from many difference sources. As long as that source is reliable, I can begin testing the dish. In this case, the source is a darling milking cow named Roxie. I trust Roxie. She has her own cookbook! Roxie is the beloved mascot of Arizona’s hometown dairy, Shamrock Farms, one of the largest family-owned and operated dairies in the United States. In business since 1922, Shamrock Farms produces and distributes a variety of farm-fresh dairy products like milk, cream, cottage cheese, sour cream and ice cream, all made with milk from cows not treated with the growth hormone rBST. Shamrock Farms is currently home to 10,000 traditional and organic milking cows, including Roxie. 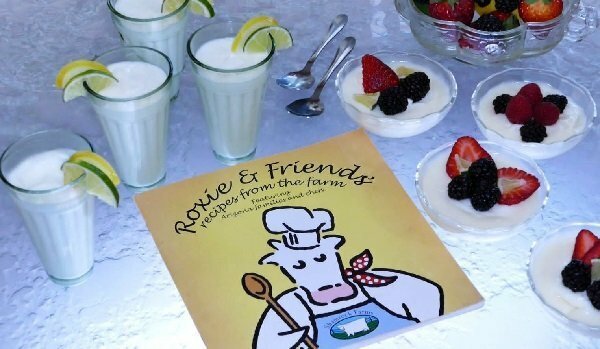 Her Shamrock Farms’ Roxie & Friends Cookbook is collaboration between professional chefs and Arizona families, and it’s a lot of fun to cook through. One of my favorite Roxie recipes is the refreshing White Velvet Dessert. It’s a luscious treat that tastes like cheesecake, but with a silky smooth texture. It’s fantastic with either the citrus twist or the traditional vanilla flavor, and with only four ingredients, it’s kid friendly, family-tested and Roxie approved! In a small pot, place lemon or lime juice. Gently sprinkle gelatin over top. Wait for about 2-3 minutes until gelatin dissolves. Bring the heat to medium. Very gently stir or shake the pot until the gelatin lumps are gone. Stir in granulated sugar and bring to a boil, stirring to dissolve sugar. When sugar has completely dissolved into a clear liquid, turn heat off, remove pan and let liquid cool for about 10-15 minutes. Add sour cream to the liquid and stir to completely incorporate. Spoon mixture into 4 dessert or parfait glasses. Cover and refrigerate overnight. When ready to serve, garnish with fresh citrus. In a small pot, place room temperature water. Gently sprinkle gelatin over top. Wait for about 2-3 minutes until gelatin dissolves. Bring the heat to medium. Very gently stir or shake the pot until the gelatin lumps are gone. Stir in granulated sugar and bring to a boil, stirring to dissolve sugar. When sugar has completely dissolved into a clear liquid, turn heat off, remove pan and let liquid cool for about 10-15 minutes. Add sour cream and vanilla extract to the liquid and stir to completely incorporate. Spoon mixture into 4 dessert or parfait glasses. Cover and refrigerate overnight. When ready to serve, garnish with fresh berries.